Monopoly Jail is the first corner space on the Monopoly board after Go, which is the starting square for the iconic board game. The other corner spaces are Free Parking, which under normal Monopoly rules does nothing for or against the player, and the Go to Jail space, which is one of several ways for your player to be sent to jail. Don't worry about landing directly on the Jail square. If you are not sent to jail, you are considered "just visiting." While you are there, say hello to Jake the Jailbird, the character behind bars who's always in jail on the Monopoly board. It's also considered fair to make fun of any players in jail while you are visiting (as long as it's all in good fun, of course). If any of these four scenarios happens, you cannot continue your turn, and if you passed Go during that roll, you cannot collect $200 in salary. If you rolled your way to Jail, you cannot buy any property you would have landed on had you taken your turn, or pay any rent to the owner of that property. 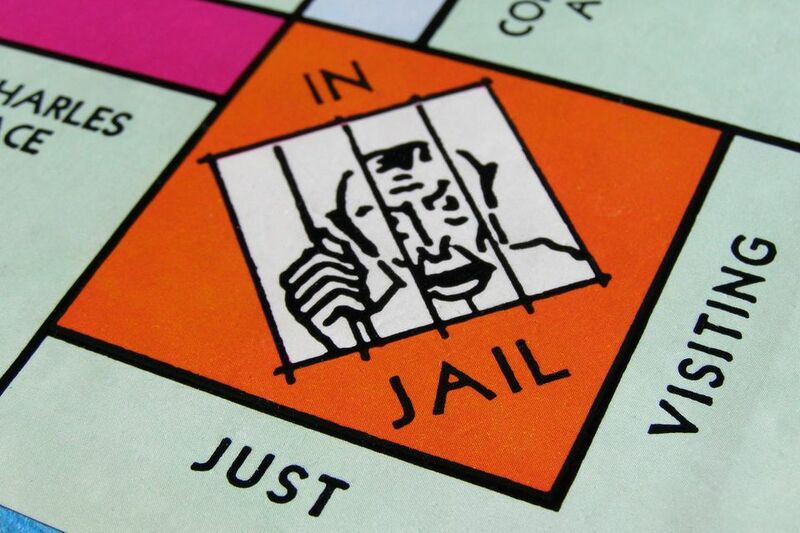 Your play doesn't come to a complete halt while you are in jail in Monopoly. You can still buy, sell, and trade properties and collect rent. You collect the same rent in jail as if you were not in jail, which means you can collect for houses or hotels on your properties. If you do not have any houses or hotels, but own all properties in the color group, you still collect double the stated rent. You can still buy properties while in jail. Obviously, you will not land on properties to buy, but you can make deals with other players and participate in property auctions. You can sell or mortgage property while in jail. This can be useful if you need the cash to get out. You can trade properties with other players while in jail. When you are sent to jail, your turn ends. But don't worry, you won't be stuck in jail for long. When it's your turn again, you can choose one of four options to get out of jail. Pay the $50 fine. After paying, roll the dice and move your token as normal. Use a Get out of Jail Free card if you own one. As with paying the fine, you can then roll the dice and move as normal. Buy a Get out of Jail Free card from another player, which can be a good deal if you can negotiate to pay less than the $50 fine. Roll the dice. If you roll doubles, you are set free and can move forward just as if you had rolled those doubles on a normal turn. However, you cannot roll again as you would normally do when rolling doubles. You can't choose to pay the fine or play a Get out of Jail Free card after failing to roll doubles unless this is your third attempt. If you fail to roll doubles on the third attempt, you must either pay the fine or play a Get out of Jail Free card. If needed, you can sell houses, mortgage a property, or sell a property to raise the money for the fine. After paying the fine, you may move forward the number of spaces indicated by your failed attempt to roll doubles. If you are unable to raise the money to pay the fine, you have gone bankrupt and you are out of the game. Monopoly jail isn't always a bad thing. In fact, as the game progresses, jail can become a good thing. Early in the game, you want to keep moving around the board to land on properties to buy and build your real estate portfolio. At this stage, going to jail means forfeiting that opportunity. You will want to pay the fine or use a Get out of Jail Free Card on your next move. But later in the game, when most of the properties on the board are already owned, the only benefit of moving around the board is the $200 collected by passing Go and the chance of drawing a beneficial card after landing on Chance or Community Chest. If your opponents have houses and hotels, staying in jail can be a great way to avoid them. In jail, you are still collecting rents from your properties and your opponents may need to sell or trade their properties. You get the benefits without the risks. However, as much as you might want to stay in jail forever, you must leave if you roll doubles or after your third failed attempt at rolling doubles. If you are playing by the alternative short game rules, you must leave jail on your first turn. This means you may immediately attempt to roll doubles, and failing a successful roll, you must pay the fine or use a Get out of Jail Free card. You can set your own house rules regarding jail, as well as other aspects of the game. You may encounter other players whose house rules include not collecting rent while in jail, or getting a second roll after rolling doubles to get out of jail. These vary from the official rules, but you can choose to follow them if you wish.